There is an info and links for every game during the selected season - link to the match itself, to the tournament, links to the involved teams, information about the match strategies. 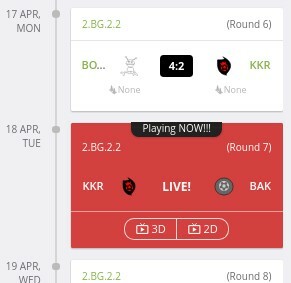 For finished games the result in black box is a link to the match viewer, for live games there are links to 3D and 2D viewers too. For every future game you can set the lineup, the match strategy and the start time. Also, it is possible to change the start time for all future home games at once.